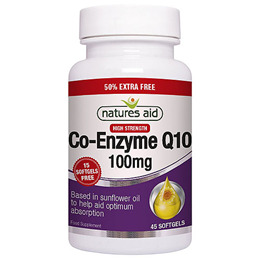 Natures Aid Co-Enzyme Q10 high potency formula may contribute to maintaining cardiovascular health. 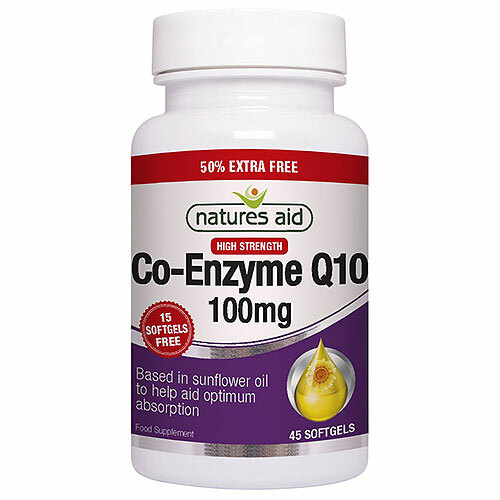 Co-Enzyme Q10 is an enzyme like substance that plays an important role in the release of energy from the food we eat. Sunflower Oil, Gelatin, Glycerine, Co-Q-10, Silicon Dioxide, Natural Colours (Black Iron Oxide, Red Iron Oxide). Free From: Artificial Flavours, Colours & Preservatives, Lactose, Yeast & Gluten, Corn and Soya. Take 1 softgel per day with food do not exceed recommended daily intake. If you are pregnant, breastfeeding, taking any prescription medication or have a medical condition, consult your healthcare practitioner before taking this product. Below are reviews of Natures Aid CO-Q-10 - 50% EXTRA FREE 30+15 Softgels by bodykind customers. If you have tried this product we'd love to hear what you think so please leave a review.